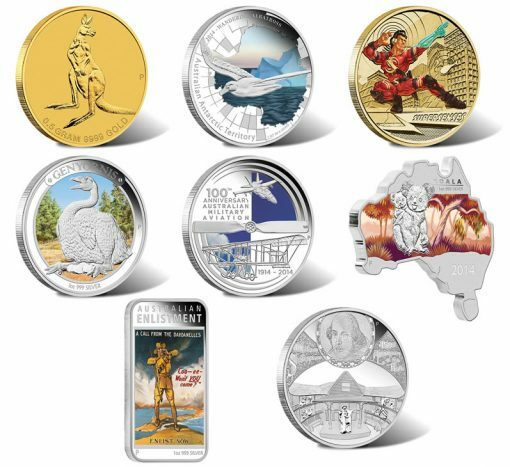 The Perth Mint of Australia offers collectors several new products in March that showcase varying subjects like literature, fauna and even the concept of super powers. Among releases is the newest Mini Roo Gold Coin struck from 0.5g of 24-karat gold. The fifth release in the Perth Mint’s Australia Map Shaped Coin series appears with a reverse emblematic of the koala. 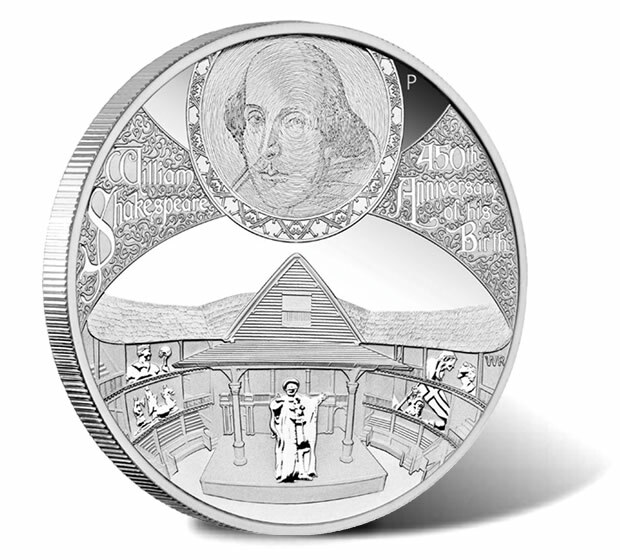 A celebration of the 450th Anniversary of William Shakespeare is offered with the 2014 William Shakespeare 5 oz Silver Proof Coin. 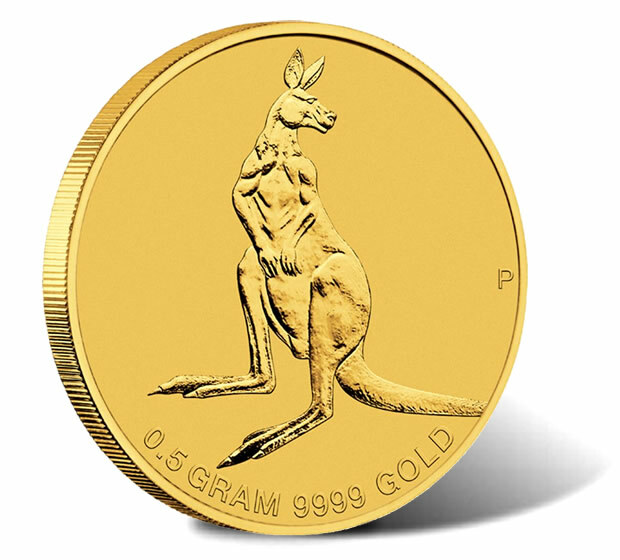 Since 2010, the Perth Mint of Australia has offered a Mini Roo Gold Coin. Like previous issues, the 2014 Mini Roo is composed from 0.5g of 99.99% pure gold. The series features annually changing reverse designs with the newest coin showing a single kangaroo in a classic stance. Mintage of the "button-sized," 11.60 mm diameter coin is unlimited with customer demand determining the total number sold. Each coin ships housed in a protective capsule attached to a colorful wallet-sized card. Pricing is currently AUS $54.09, or US $48.27. 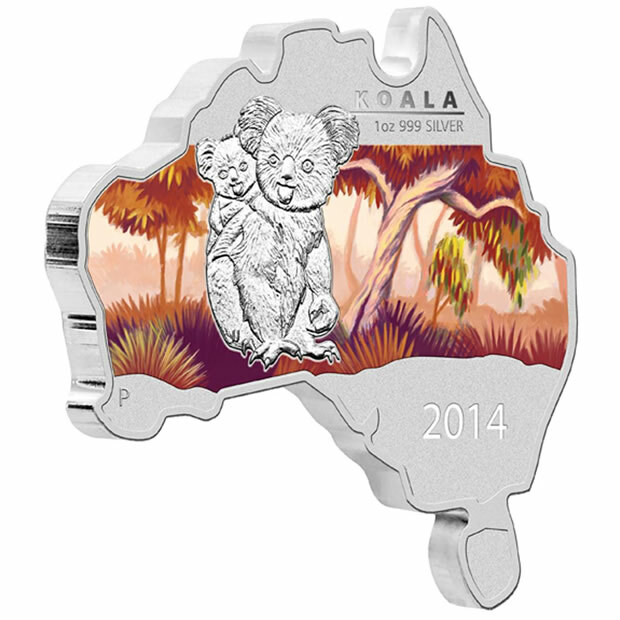 2014 Australian Map Shaped Koala Silver Coins appear as the fifth issue in this 99.9% pure silver series. This series is unique in that each coin is struck in the shape of the Australian continent. Shown on the reverse of the newest issue is the image of an adult koala with a baby joey clinging to its back. A colorful bush scene appears behind the marsupials complete with their typical habitat of eucalypti trees. Mintage is limited to 6,000 with pricing currently at AUS $94.55, or US $84.37. The 2014 William Shakespeare 5 oz Silver Proof Coin marks the 450th anniversary of Shakespeare. Each coin is minted from five ounces of 99.9% pure silver and shows a likeness of the writer on the reverse along with a representation of scenes from some of his works. William Shakespeare is perhaps the best known English writer in history. Many believe Shakespeare is the greatest writer in the English language with his works still read and performed today. His body of work includes 38 plays and 154 sonnets along with narratives and short poems. These are still taught in schools today. Mintage of the coin is limited to 450. Pricing is currently AUS $440.91, or US $392.86. 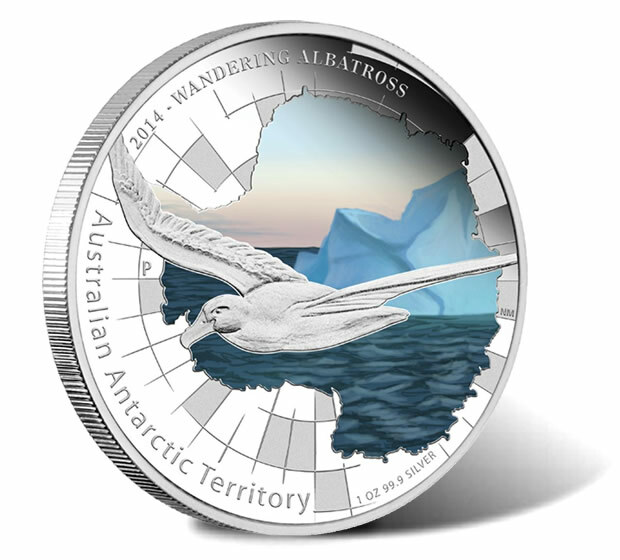 2014 Wandering Albatross 1 oz Silver Proof Coins are offered as the eleventh issue of the annual Australian Antarctic Territory series. The coin’s reverse features a likeness of the wandering albatross set against a colored iceberg and ocean scene. The albatross has the largest wingspan of any living bird. Each coin depicting the creature appears in a classic charcoal-colored Perth Mint display case and ships inside an illustrated shipper. No more than 7,500 of the coins will be sold. Pricing is currently AUS $90, or US $80.19. The third release of the Perth’s Australian Megafauna series is the 2014 Genyornis 1 oz Silver Proof Coin. 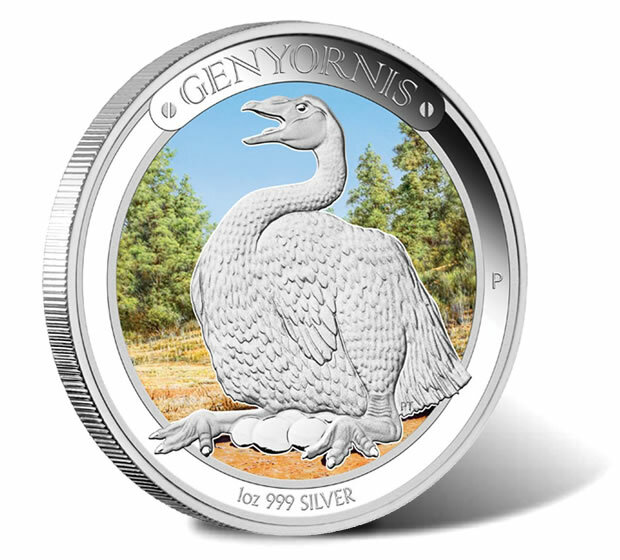 Shown on the reverse is a depiction of a genyornis believed to have inhabited the Australian continent in the Pleistocene period. Previous series issues depicted the Procoptodon and the Diprotodon with future issues to showcase the Thylacoleo and the Megalania. Each coin is housed in a Perth Mint display case and ships with an illustrated shipper which also contains a likeness of the creature. Mintage is limited to 6,500. Pricing is currently AUS $90, or US $80.19. 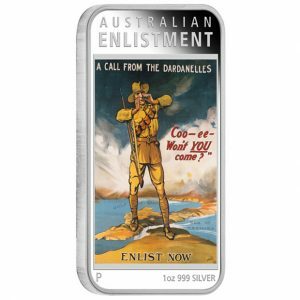 A new series of coins depicting Australian Posters of World War I debuts with the 2014 Enlistment 1 oz Silver Proof Rectangle Coin. Shown on the reverse of this coin is a colored likeness of the historic "A Call from Dardanelles" Australian World War I enlistment poster. Each is produced to a rectangular shape with the specifications of 47.60mm by 27.60mm. A stylish latex case accompanies every coin along with an illustrated shipper. Mintage is capped at 5,000. Pricing is currently AUS $90, or US $80.19. A military theme appears on the 2014 100 Years of Australian Military Aviation Silver Proof Coin. 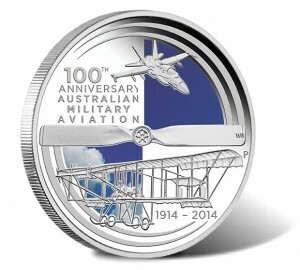 This coin honors the centennial of the first flight of an Australian military aircraft, the Bristol Military Biplane. Mintage is limited to 5,000. Pricing is currently AUS $90, or US $80.19. 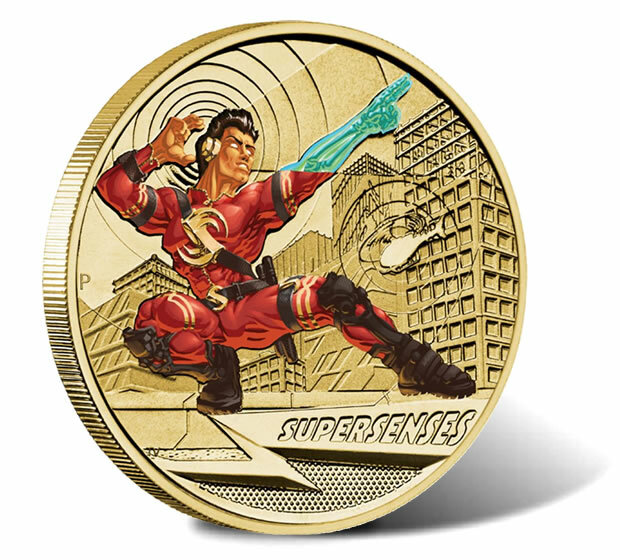 The 2014 Young Collectors Superpowers series features six coins each depicting a different superpower. 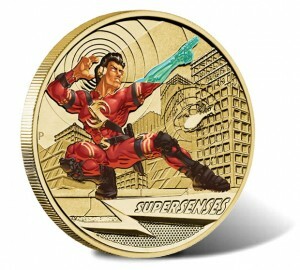 The first issue of the series is the 2014 Super Senses $1 Coin. Its reverse depicts a superhero in color poised on a rooftop high above the city, using his x-ray vision and sonic hearing to see and listen to the city around him. Each is struck from aluminum bronze and is attached to an illustrated presentation card. Mintage is unlimited. Pricing is currently AUS $13.59, or US $12.13. Affiliate Link to Product Page.